The film Diyos-Diyosan is a socio-political film that tackles a very timely issue -- national elections in the Philippines. Written and Directed by Cesar Evangelista Buendia, this film aims to educate all the Filipinos to become a responsible and wise voter. 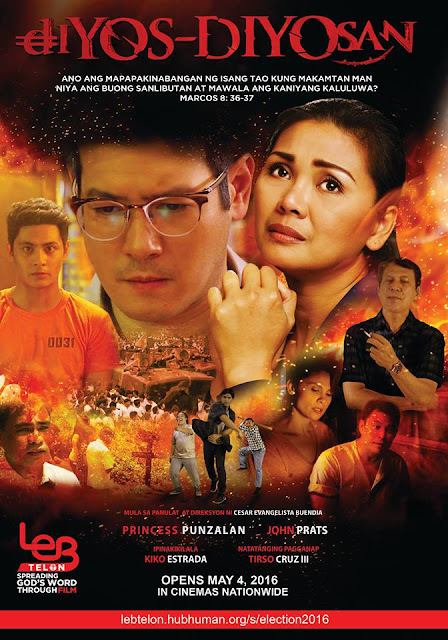 Starring ABS-CBN Banana Split star John Prats (Sen. Bernard Mojica), and veteran actress Princess Punzalan, the film Diyos-Diyosan challenged their versatility as an actor. It also stars Tirso Cruz III and introducing here is Kiko Estrada. The story revolves around Mojica’s life struggle to be recognized by the society but soon after that recognition becomes his hunger for power. It is timely for those wanting to change the nation through the ballot. A must-see for all Filipinos who love the country. Diyos-Diyosan touches on the culture of corruption in the Philippines and that our leaders seem to have lost their statesmanship and patriotism.